Here you can book 1-1s and classes, access online training and hire our gorgeous AstroTurf indoor venue. I’m passionate about competitive agility. 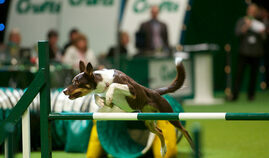 My competition dogs run at the highest level in the UK – Championship. They've won 13 CCs and 6 RCCs and had major wins at Crufts and Olympia. The website I share with ACPAT canine physiotherapist Nicky Grant - www.winagility.com - offers lots more useful online training resources." Type your e-mail address here, then hit Submit. That's all there is to it!